Since I am going into my fourth year of college, I feel like I have learned a thing or two about being a good roommate. Luckily, I had the same roommate the 2 years I lived in the dorms and we got along great! But many of these rules still apply if you are living in an apartment or house with housemates too. I recommend doing this the first week of living together before any problems have the chance to arise. Decide on things like if you want quiet hours, what things (like appliances) are shared items, when you can have friends over, and chores. Going along with one, you will want to make a rotating cleaning schedule and agree at the beginning of the year that everyone needs to stick with it. When I lived in a dorm, 4 girls shared a bathroom so we just had a schedule where a different person cleaned the bathroom every week. Now that a live in a house, we have a schedule where one person cleans the bathroom, one cleans the kitchen, and one vacuums and mops every week. This keeps our house clean and we don’t have any arguments because we always know who needs to clean what. If you roommate is studying, leave them alone and try not to be loud. If you come home at night and your roommate is in bed, try to be as quiet as possible because no one likes to be woken up. If you are close with your roommates, it is usually fine to borrow a shirt or use an egg if you ran out. But it never hurts to shoot them a quick text and ask, because nothing is worse than needing to wear a specific piece only to realize it is on your roommate and they are miles away! If you do have something that is bothering you, and it is something that needs to be addressed and not something you can just ignore, address it before it gets any worse. No one wants to cover for the roommate who can’t pay their share of the rent. Don’t be that roommate. Whether is it intentionally choosing to hangout or intentionally doing something that you know will help them (like taking out the trash), in the long run it will help you be an better roommate! Maybe your roommate wants to put up a decoration that you think isn’t very cute. Or maybe they want to put the plates on a different shelf in the cupboard than you would like. But in the long run, it is something that really isn’t a big deal so it is something that should be compromised. No one wants a roommate who has to have everything her way. 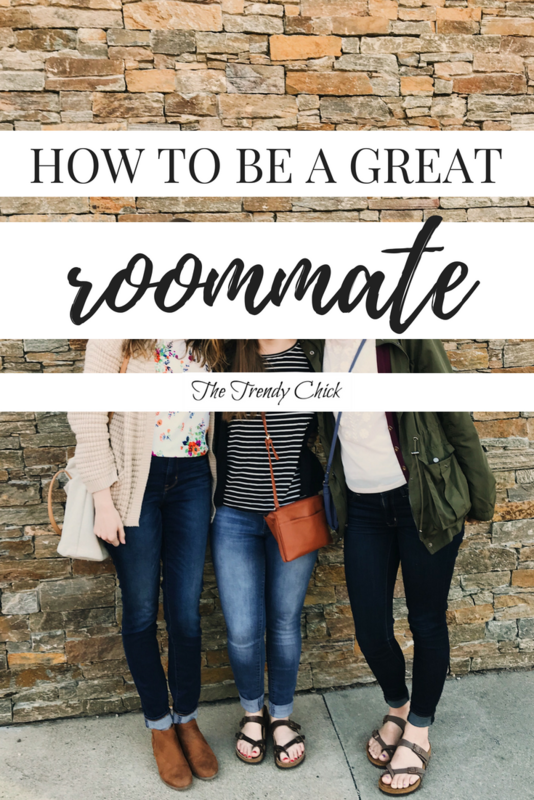 What are your tips for being a great roommate? Previous Post Happy Fourth of July!